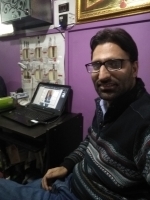 I work as a dentist for more than 4 years.i have worked for one year as a junior resident in the department of oral medicine and radiology at Government dental college and hospital srinagar .I have expertise in managing all kinds of oro dental diseases like ulcers,bleeding gums,bad breath,psychiatric issues of dentistry,TMJ problems,Wisdom teeth issues and impacted teeth,burning mouth,dryness of mouth,oral cancers,TMJ sounds.in addition to this i can also manage Gastro intestinal disorders like Nervous dyspepsisa,Irritable bowel syndrome,gastritis and heart burn. – Geo*** Streapy, Leesburg, United States. – Dom****ue, Flat Rock, United States. – Jen**** Jones-D, Atlanta, United States. "Thanks doctor, i will try that ..."
– Ces**, Lompoc, United States. – Jes****, Trenton, United States.